This wool rug is well made, and it's nice and thick. The rust color has a nice orange tint to it and is accurate to the color shown on line. I liked it so much a bought another one. Safavieh's Heritage collection is inspired by timeless traditional designs crafted with the softest wool available. 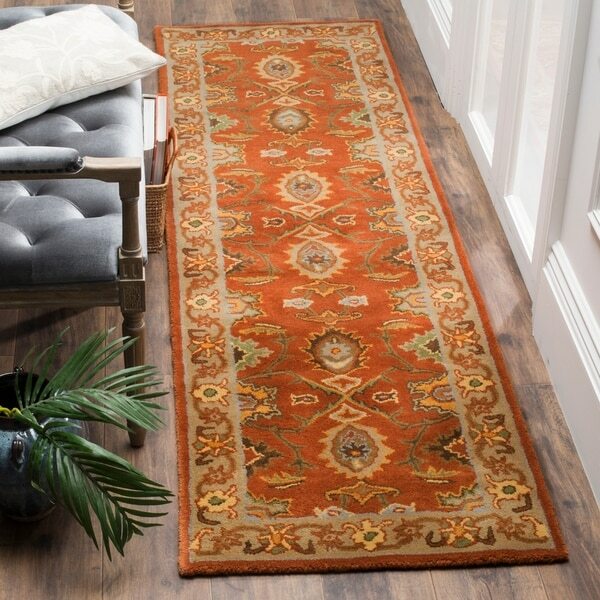 This rug is crafted using a hand tufted construction with a wool pile and features main accent color of rust. Elegant designs and rich colors of this rug is inspired from the 19th century antique Persian rugs. 1-percent wool is used with a luster wash finish to give it a soft finish to ensure this is one of the most luxurious rugs. Dimensions 2 ft. 6 in. x 6 ft.
Love the colors and quality of this rug! I love the vibrant orange/yellow colors this rug has. So far, it hasn't shed a whole lot, just what is to expect on a wool rug if you know what you are ordering. This isn't a problem after a couple of weeks, and vaccuming 3 or 4 times. I ordered 3 different sizes at first, and recently added one more to my entrance hall. It's a beautiful rug. it's thick piled, soft and the colors are as pictured and rich looking. it brings just the right amount of color into room with out being too bright. The high quality ensures it will wear well and bring me years of pleasure. I am amazed at the quality. I have a real oriental hand hooked area rug, this one is comparable in appearance (albeit smaller!) A little lighter than I thought, the main color is more like terra-cotta than rust, and has beige, sage green, olive green, moss green, and a little grayish blue and papaya. So pretty. Great rug! Pix is accurate. Well made. Very plush and great value for being a wool rug. 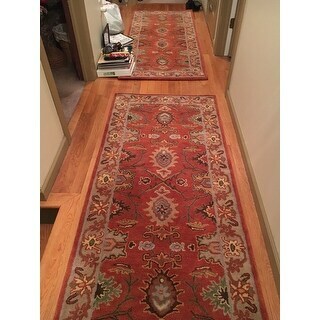 Quality never disappoints..
Great wool runner for the small hallway between the kitchen and laundry room. Purchased this along with the 6' round and 4x6 for the kitchen. All great quality and colors true to photo. Overall great quality. This is a beautiful entryway carpet. It is actually the second one I’ve purchased. Color is as shown in picture, beautifully made for the price. I’ve owned my other one for several years and it’s help up very nicely. I would highly suggest this carpet. 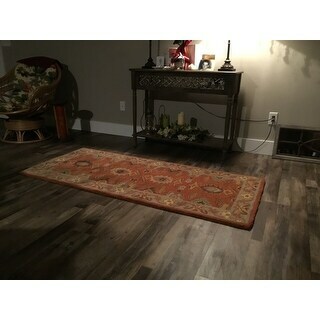 Very beautiful and gorgeous thick rug that matches with brown stools, and other red rugs in the same room. Very happy about this purchase. It doesn't shed at all. I ordered this runner for the landing on the stairwell to blend in with the 2 diamond patterned runners I purchased from you. Matches hall rug we just received. We love the color combinations. "Is this rug a true rust color or is it more of a salmon?" Hello ashley1969, we try to represent the colors of our products accurately. Unfortunately, due to the difference in monitor colors we cannot guarantee that the color will match exactly what you see on your screen. Thank you for shopping with us!